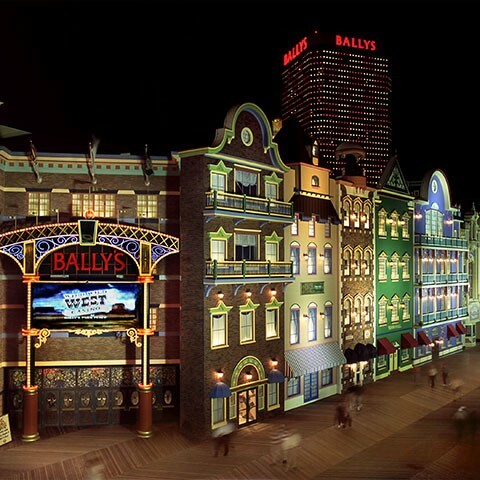 Located on the boardwalk, Bally’s Atlantic City hotel combines comfort with history and tradition. Accommodations at Bally’s offer inviting interiors and a wealth of amenities designed to make your stay a luxurious one. Chic and stylish with a cosmopolitan elegance, Bally’s offers world-class accommodations in 1,750 rooms, no appetite goes unsatisfied with 13 restaurants. The Walk Outlets features exciting shopping, rejuvenate at Bellezza Salon and Spa and catch your wild side at the Wild Wild West Casino with beer pong and mechanical bull. Whether you prefer the strategy of Blackjack or the fast action of Craps, all of them are played on the most thrilling Atlantic City table games on the Boardwalk. Grab the dice, double down or place your bet on red or black; there’s never a dull moment on this casino floor! Bally’s Atlantic City Casino offers the ultimate Atlantic City video poker experience on a completely remodeled slot floor, with numerous casino slot machines including progressives, video reels and all the newest games. Now Bally’s welcomes the hottest slot machines, straight from Asia, to bring you the best in Asian gaming. Players will find favorites including 50 Dragons, 50 Dragon Deluxe, 5 Dragons, 5 Dragon Deluxe, Choy Sun Doa, Choy Sun Returns and Fortune King exclusively at Bally’s. Try your luck on the #1 slots from Asia today! Sink into the spacious, comfortable seat at your lucky game, no matter what denomination you’re playing. The Atlantic City video poker game inventory on the Bally’s slot floor includes nickels, quarters and dollars in popular variations like Super Times Pay, Triple Play, and many more – including the ever-popular 9/6 Jacks or Better.